It was a busy weekend around here. Well, for some of us. Not the cats. Hamish, top, and Basil still seem to be growing at just over 10 months old. Bigger and as naughty as ever! We had the pleasure of having my nephew James spend some time with us on Saturday. My sister was in town for a play (I think it was called Spank... probably inappropriate for a 10 year old, you can look it up on your own) with my mother, aunt, cousin and more. An interesting group to see such a play maybe? I wonder how many 'uncomfortable' moments they may have had. Heh, heh, in my imagination it is hilarious! Okay that was for them, share if you wish, Mom and Sis! Anyway, the afternoon got off to a bad start, we went to an event I found on the internet that was not at all what I expected. But after we got back home we were able to go through some of my old Piers Anthony books. He's been interested in the Xanth series so I gave him all those books that were in good enough shape and threw out the old and damaged ones. I also gave him the Adept series that I remember really enjoying. After that I went through my Kiss CDs - he's a fan - and managed to give him several that he can enjoy until I can give him the rest of them. I never did get the complete Kiss catalog on CD, like I managed to collect every album on vinyl (still have them!). Digital is everything now and CD's are not as big of a priority for me anymore for most music. I think he only has a couple so I'm happy to give him some new-to-him Kiss to listen to. For dinner, we took him out to a nearby landmark, a place called Ella's Deli. Unmistakable along one of the city's main arteries, especially in Summer when the carousel outside is uncovered and all lit up! Inside it is full of all sorts of moving, flying, spinning everything. You can see some of the hundreds of displays here, but photos are still and the whole place is actually in mesmerizing motion. I hadn't been inside there for at least 15 years, so I think I had as much fun as he did! Sunday was a pretty fun day. I had a pretty casual morning, my wife did a lot of housework. As usual she wins that battle, I realize it and do feel guilty. We went out to brunch with our friend Bridget along with Zubin and several of her friends for her birthday - Happy Birthday, Bridget! It was a nice place and even though the service was a bit slow the food was good and we had a very good time. It was actually a very nice day out - sunny with no wind and above freezing, a nice day to be out and about. Afterwords we stopped for a few drinks at another local watering hole before going home and relaxing for an hour or so. Then, the neighbors a few houses up the street were having a gathering for all their neighbors and friends, including our local alderperson, so we went up and socialized for another hour and a half or so. I like our part of town, there are many like-minded people here and who wouldn't be comfortable with that? Many are youngish couples, some with children, and relatively recent to the neighborhood, as we are. All in all a nice day and an unusually busy weekend for us, yet I showed up for work this morning with a great big smile! I've worn the same shoes for about 20 years now. No, not the same exact pair, I've had several pair over the years. 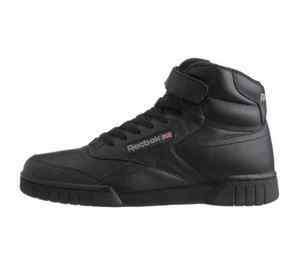 They are completely black tennis shoes, leather, and high top. Well, not the high tops that I remember from the eighties, they come up around but not above my ankle. I remember a doctor a couple years ago remarking to me that he liked the type of shoes I was wearing, they would help my back, or knee, or whatever problem I was having at the time. I like these shoes because they are comfortable, and the completely black color lets me get by wearing them for any occasion. Whenever I get a new pair, the old pair gets demoted to yard work or other uses when you would rather not wear your 'good' shoes. The style has changed slightly over the years, but it would be hard to tell unless you had them side by side as I have many times. So when my current pair started squeaking, meaning it was getting moisture in the sole when it is wet out, I started looking for my next pair. I didn't like what I was about to find out. They changed the color of the soles! It was no longer the black tennis shoe that I could wear for any occasion. Why, after all these years, would they change it? And now what the hell am I going to do? Shoe shopping has been so easy for me for so long. All it used to take was a very short trip to the shoe store, I didn't even need to try them on. Recently the internet has made that even easier - click click and it shows up at my door. I don't think I even want to consider the new style, which means I need to do some actual shoe shopping for the first time in ages. I dread going in to one of those large chain shoe stores and emerging hours later with shoes that I settled for. But do I trust shopping for something so intimate to my daily comfort online? I'm not sure what I'm going to do yet, it's all just so much to take in! Tears. Drama. Anger. Resignation. Acceptance. Sigh. Eff you, Reebok. PTFO. Happy Valentine's Day, yada yada. We're not doing anything special though I may try to make tonight's home made pizza into a heart shape. Here's a funny vid from 5SF, video may be NSFW. Okay, now that that's done, I've been hanging on to a few things that I wanted to post, but felt that I was posting too much other stuff rather than writing. I've narrowed it down to one more video, a Superbowl commercial that I missed live and came across later. Esquire interviews the man who killed Osama bin Laden. As much as I hate winter in Wisconsin, it could be worse. This is Friday in Hartford, Connecticut. Reposted from Bits & Pieces! Last night we met our friends Bridget and Zubin at the Malt House for a few drinks. Having the next day off, I eventually had some of the absinthe, Livid was the brand. Bridget took photos, but it seems that uploading all those pictures from my Mom's retirement party to flickr has put me over the limit for the time being, so this is just a similar pic from the internet. I've had absinthe a couple times before, but never for an evening. I had two last night and still drove home easily. One of these days when I have the time - and extra cash - I think I would like to see what it is like to drink absinthe exclusively one night and see how I like it. Maybe I won't write the next great american novel or even paint the latest greatest masterpiece, but it might be a nice drunk! Time to post something, even though I don't really feel like it. Although I have been over the worst of it since about last Wednesday, this cold is still lingering in me. Saturday I started a stretch of 8 out of 9 days off. Just a little time off for myself to do something - or nothing, depending on the day. Sleep is what I really want. Good, long restful sleep is always hard to come by these days, but I shall try to achieve it. Sigh, maybe tomorrow. Oh, I did not jinx myself and passed the needed tests to take the other position at work. That will not start for many months yet, though, so anything can happen. Until then I plan on keeping my eye out for other positions that may better suit me.